When first adopting a gluten-free diet there are plenty of obvious gluten sources that need to be eliminated. Bread, pastries, pasta and biscuits are all no-brainers. The challenge lies in identifying wheat and its derivatives in the not so obvious places. Any chocolate lover following a gluten-free diet will no doubt remember the shock of first discovering chocolate isn’t always gluten-free. Why isn’t chocolate always gluten-free? There are two explanations for why gluten finds its way into chocolate products. It’s either included in an ingredient that is being added to flavour the chocolate, such as in cookies and cream chocolate bar. Alternatively, it’s being used as a thickener. Cocoa mass, cocoa butter, sugar, vanilla and soya lecithin are the only ingredients in the chocolate produced by New Farm Confectionery. The milk and white chocolate varieties also include milk solids. While manufacturers from other categories have embraced the growing demand for gluten-free food, our chocolate manufacturers have been slow on the uptake. Cadbury Dairy Milk, once considered gluten-free by ingredient, now carries a “may contain traces” warning. The Cadbury website in Australia doesn’t provide any information in regards to products containing gluten or possible cross-contamination risks. The only allergen statement on the site is concerning nuts, and in case you’re wondering their entire range of chocolate products may contain traces of them, too! We checked the labels of numerous Cadbury products before publishing this article. The only product we were able to find that was gluten-free by ingredient and also without a “may contain traces” of gluten and/or wheat warning, were Twirl bars. Nestlé manufactures Australia’s oldest and most popular chocolate bar, the Cherry Ripe. While it’s sadly not gluten-free, Nestlé is much more helpful when it comes to navigating their product range and ingredients. Their website contains an Allergen Centre with handy fact sheets on various food allergies. There’s also an explanation about how and why they label their products the way they do. Best of all, you can download a list of gluten-free products straight from their site. The list states the products featured include “no cereals containing gluten or ingredients derived from cereals containing gluten and are not manufactured on equipment processing products containing these ingredients”. Before you get too excited, according to the most recent list supplied by Nestlé (dated November 2016), there are only two chocolate products that are gluten-free: ALLEN’S Freckles and Nestlé Scorched Almonds. You can download this list here. If you don’t mind whipping up your own chocolatey treats – Nestlé can assist with products from their Baker’s Choice range. At the time of printing the cocoa, choc bits and choc melts were gluten-free. Of course, ingredients and production methods do change, so always check the label before purchase. In the last three years, our tastes have become more adventurous. 10 years ago who had heard of acai, maca or teff? Raw chocolate is another unusual product that has started to appear on supermarket shelves. 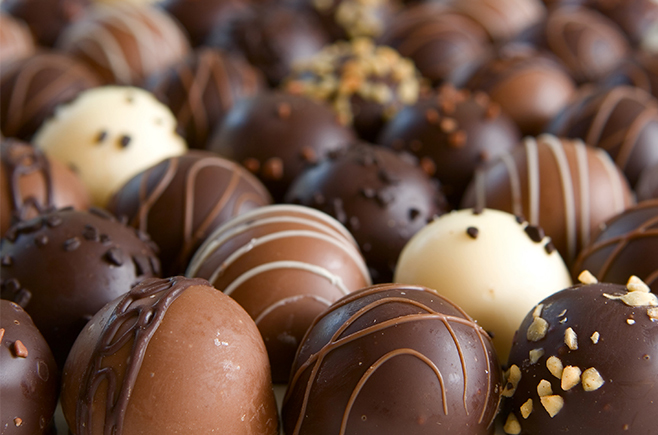 The cacao beans used in raw chocolate production are never heated above 42°C. Manufacturers of raw chocolate claim that traditional chocolate production, where beans are heated to over 130°C, affects the nutritional value of the ingredients. They also argue that the heat alters the complex taste and texture of the cacao bean. As with many of these new “health” products, studies to support these claims are limited. While there is an abundance of research to show the benefits of raw cacao, nothing at present shows that heating cacao negatively impacts on the beans’ antioxidant properties. While the verdict may still be out on the health benefits of raw chocolate, it is worth noting that most, if not all raw chocolate bars currently for sale in Australia are gluten-free. With less sugar than traditional chocolate and regularly made from certified organic ingredients, they are certainly less processed, and that can only be a good thing.